The Dermapen microneedling pen uses sterile, sealed individual disposable needle cartridges for optimal patient safety, comfort and results. Every Dermapen needle tip has multiple needles, with proprietary technology, penetrating vertically generating small micro skin channels, while stimulating the skins natural ability to heal its self while increasing the production of new collagen. Is it as effective as lasers or chemical peels? The closest technology to the Dermapen is a fractional laser. A fractional laser “drills holes” in the skin to create a wound healing response and leaves normal tissue around the holes to be a reservoir for fibroblasts and stem cells to migrate into the holes. Fractional radiofrequency devices work on a similar principle and have many of the same side effects as fractional lasers (Yeung et al., 2012). Dermapen also makes holes in the skin to create a wound healing response and leaves normal tissue around the holes. These technologies have similar results, but achieve them in very different ways, and result in very different side effects profiles. The laser uses light to char and obliterate epidermis to produce small pits which vary in diameter and depth, depending on the laser type (Erbium, YAG, CO2; nonablative vs ablative) and manufacturer. Dermapen produces reproducible and consistent holes in the skin. Side effects differ between technologies. Most fractional lasers leave erythema and edema up to 96 hours after treatment. Resultant downtime is approximately 3-4 days for fractional laser treatments (Gold, 2010). 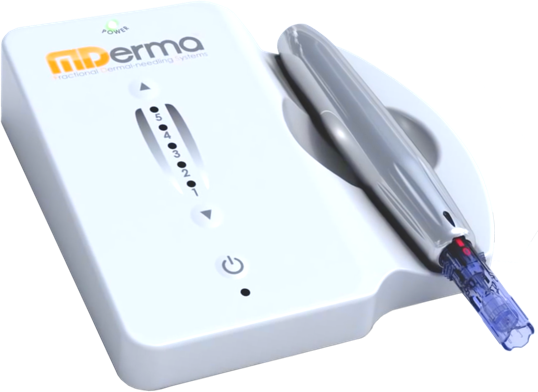 Dermapen treatments result in erythema with slight chance of edema for about 24 hours. Common side effects of fractional lasers are: pain, infections, post inflammatory hyperpigmentation or hypopigmentation. Is it painful and is there any downtime? A topical numbing anesthetic is applied to the skin prior to the procedure. This is considered a lunchtime procedure and there is no downtime. How many treatments will I need to obtain results? Each treatment varies but typically sold in a series package. At Governors MedSpa and Concierge Medicine we can offer a solution that doesn’t require using the patients’ blood and still delivers the benefits of regenerative cells. Using natural stem cells, a growth factor serum has been developed that can be applied to aid in the enhancement of the skin. Promoting the enhancement of skin with reduced post-treatment inflammation. Using a more natural alternative to harsh chemicals or exfoliants to rejuvenate the skin. Growth factors control cellular growth and promote the gradual resurfacing of the skin. Collagen and elastin, essential nutrients for skin elasticity and tightness, experience increased production. Circulation may also be improved in treated areas, restoring a youthful glow to aging skin.